Are you trying to move forward without a mentor? If so, you are missing out on a tremendous blessing that the Lord would love to give you! By learning the hard way – simply by trial and error. You know … the school of hard knocks. By getting a mentor to help you navigate the next level. Different people learn best different ways. But … that doesn’t mean all methods are equal. Some people learn best through trial and error. They specialize in the school of hard knocks. That doesn’t mean trial and error is the best thing for them; it simply means that where they are in life, and with the level of character they have (even if their character isn’t developed very much at all), they aren’t able to listen to others, use godly wisdom, or plan/research well. In other words, they often only learn best through trial and error because they aren’t mature enough to receive teaching from other methods. Other people prefer to just jump in and learn from scratch by themselves. Again, learning from scratch is not the best way; it wastes time. But, if people who refuse to learn any other way, that’s up to them. The third option is both the hardest and the easiest. Someone else has gotten to a place we haven’t gotten to yet (and we can’t be jealous of them for it). Getting a mentor is also difficult because it requires us to actually follow someone else’s instructions. This can really grate against the flesh if the flesh is the ruling power in our lives! Your mentor has been where you want to go, and they know the way. Your mentor knows what doesn’t work and can help you steer clear of pitfalls. Your mentor has a bigger perspective than you have. Your perspective is clouded by your emotions, but your mentor can see things clearly because of his or her outside perspective. In some cases, your mentor may have access to people or opportunities that you don’t have – but, depending on the type of mentoring relationship you have with them, they may be willing and able to help you. So if you want to go on with God, I strongly encourage you to find a mentor this year. Finding a mentor at work can help you prepare for that promotion, get additional experience, and identify the weak spots in your resume. Finding a mentor for your marriage can help you navigate the tough waters of spousal disagreements, daily decisions, and more. Finding a mentor for your spiritual life can help you strengthen your weak spots, learn to walk closer with God, find spiritual healing, and give you the prayer support and encouragement you need. No matter how you want to grow, you can find a mentor to help you. Mentoring is God’s way … because it’s His original plan. When He created the world, He made man and woman to be a family. He told them to be fruitful and multiply. With those words, He mandated them to have children–children whom they would raise, teach, disciple, and mentor. He called it fathering and mothering. It’s always been God’s plan for fathers and mothers to raise up sons and daughters; and for those sons and daughters to eventually become fathers and mothers who raise up sons and daughters themselves. So, another phrase that means the same thing as “mentoring” is fathering and mothering. And God has always set the lonely in families. It’s His desire for you to have a spiritual father/mother; to be raised up in the nurture and admonition of the Lord. But to receive all that He has for you, you have to find a mentor. If you’re not sure how to find a mentor, I wrote a 3-part blog series that can help. Click here to read How to Find a Spiritual Father. The 3 articles in that series can help you prayerfully identify the person that you would like to mentor you … and it will show you how to approach them and ask for mentoring. So do you have a mentor? And if not, are you ready to get one? You will advance further, faster, and longer if you will find yourself a mentor. So pray about it, and find someone with whom you can be divinely aligned. Somebody with whom you share heart, vision, and DNA. You’ll never regret it if you do. Is Holy Spirit speaking to you about getting a mentor? If so, please leave a comment below. I’d love to hear from you! I desperately need a spiritual mentor and it will (for several reasons) have to be someone outside my church. I have been asking God for one just today. May he open a door for me soon, just like this article says! I need a true mentor. Cannot find one. Only Jesus can line me up. Just now I prayed for one. Not easy being heavily in debt, business floundering, 40# overweight at 6’0″, and no girlfriend in sight, and just turned 64. Praise Jesus that nothing is too hard for Him !!!!! Hallelujah! Yes I need a spiritual mother that’s not afraid to work overtime as the need is great, and the list is long. Praise God for this message because again my Heavenly Father has seen my tears and knows my needs. Glory to God in the name of Jesus, Jehovah Jireh my provider…I am nothing without You Father, please send a spiritual mother. Hey jamie! I’ve been wanting a mentor for the past few months, and just yesterday someone divinely told me I needed it, I was so happy to hear them say this, and then my mom sends me this link to your words, we both find it very confirming. I’m so excited to have a mentor. I’m finding out, even before trying, it is going to be wonderful, I’m ready to hear what someone else has to say, I don’t want to make mistakes anymore without my knowledge I’m about to make one! I’m so excited because this includes having a close friend to pray with, which is what I’ve wanted.. thanks for the confirmation. The lords spoken acceleration to me in my dreams and in prophetic reads, so I know a mentor will bring that, too, thanks again Jamie! And mom, lol. Thank you for this word, I think it is confirmation. I have been feeling quite fragile recently and haven’t been out for weeks, then met a lovely lady yesterday at a new meeting I went to. She didn’t bombard me with questions but had a kind and gentle approach and I thought to myself last night and again this morning that maybe she could be a good mentor for me, a spiritual Mother. The Lord knows our needs, I’m going to pray about this. Thank you for your ministry and God bless you and your family. Yes this is a confirming word for me as i have been praying for a mentor ever since but canrseem to find one. But I trust God will send me the one at the right time as it’s never too late. Yes your article has touched my heart. I have a question~ I believe God has started you as my mentor for now~ Can this not be so? I have learned much and had to change much through the teachings I have done with you! Right at this time in my life you are and have been my mentor from God! I knew this when we first started. I am absolutely grateful God has put you as my mentor and I have many times rejoiced over this. I cannot wait until I get another word from you that I know in my spirit is from my Father !! Thanks and God Bless!! Hi Jamie…my circumstances are such that i don’t get to fellowship often…then one day i believe God led me to your web site and i have been so grateful to God since.. I have got to learn so much from you.. You are my mentor! thank you so much for the great message,I do have a mentor in my life ,he is my dad n he is also a spiritual dad to me n to our family,now I have a family of my own,he still directing us of what to do based on God’s Word..it’s very true n i do believe Jamie of the great word of encouragement from you about having a mentor…Amen!!!!! Thanks for these encouraging and wise words, Jamie. The Lord told me a while ago to pray fervently for a mentor and a life coach. 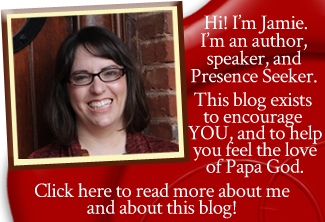 .When I first found your blog, I thought you were it! I’m sure you have many responsibilities and tasks in your ministry. But, for now, in an informal way, you really are mentoring me in a way. Thank you!